With Klisto LE 2.0 you can easily create a backup of your database. 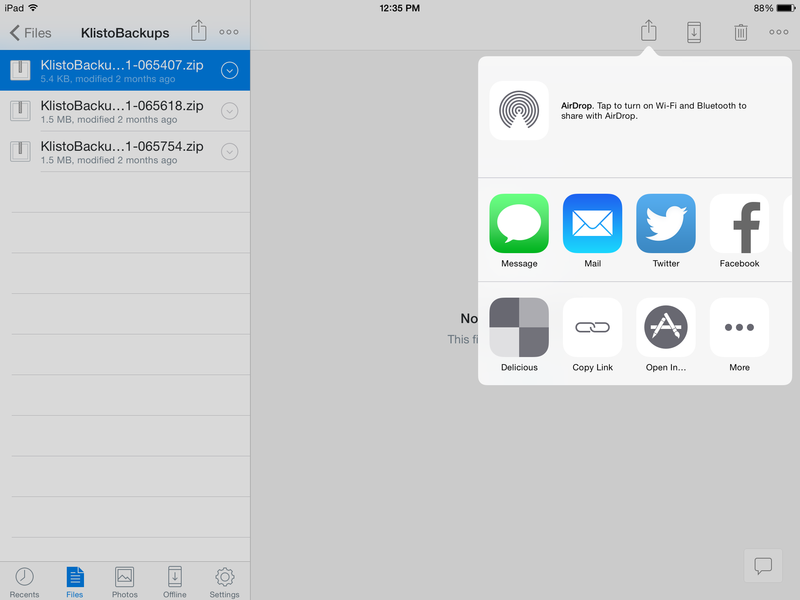 This backup includes your text data as well as image attachments. You also have the option to upload your backup to Dropbox automatically. 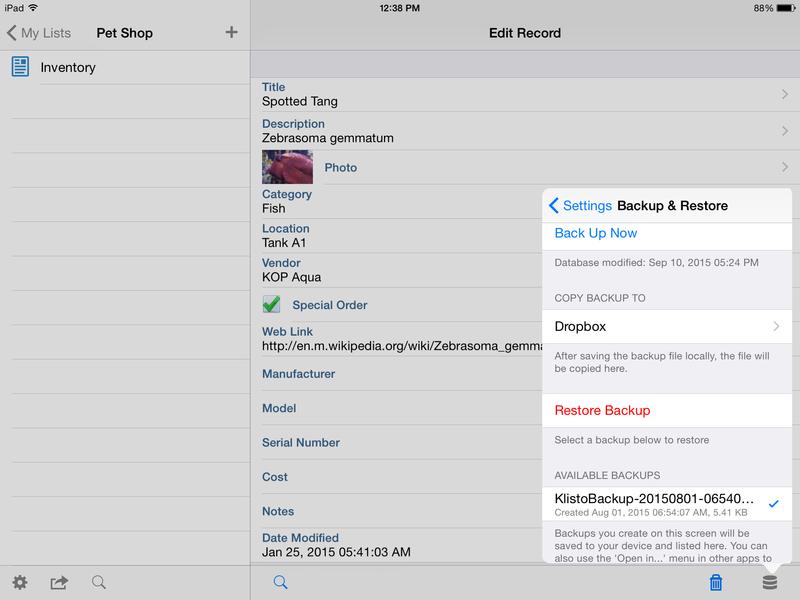 You can use your backup to copy everything to another iOS device. Just tap Open in… in the Dropbox app on your second device to copy the backup to your Klisto LE app. 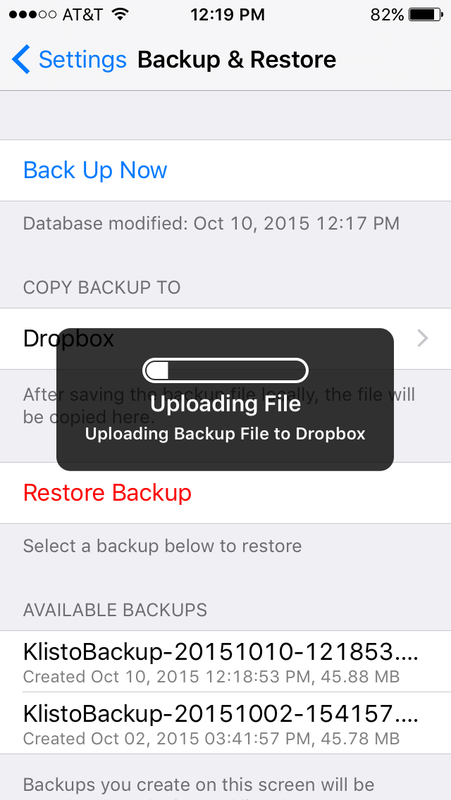 The backup file will now be displayed in the list of Available Backups on your target device. You can now restore this backup to view your data. Klisto LE is available in the iTunes App Store and is a Universal app, so you only need to purchase it once to run on your iPad, iPhone and iPod Touch. What other features would you like to see in Klisto LE? Leave us a note in the comments below. One of the early misconceptions about the iPad® was that it was not an ideal tool for content creation. This has proved false with the availability of apps for creating everything from spreadsheets to digital audio recordings. Yes, I’m a happy GarageBand app user. I recently found the need to write extended text copy on my iPad. I wanted a tool that allowed me to focus on just writing with few bells and whistles; no rich text needed. Unfortunately the first app I purchased did not provide the ability to customize. This is marketed as a feature, which was fine until an upgrade of the app resulted in a smaller font size. I find it very helpful to use larger fonts when writing on an iPad. Maybe my eye doctor can help with this, but it’s nice to have options. I also like using serif fonts like Courier. Luckily I ran across a mention of Nebulous Notes. I tried their free version and immediately knew I had found a winner. I upgraded before an hour had passed to the paid version. I am writing this posting on my iPad right now using this app. What makes it so practical? It’s as simple as you need it to be, but it gives you options. I liked being able to customize the font style and size. Setting the background to an off white color was also helpful. There is a full screen view that hides the toolbar that I really like. The bottom line is I have lots of options without getting lost or distracted. Nebulous Notes also does an excellent job of syncing with Dropbox. I can write an article locally and then upload it. Once uploaded, changes are synced automatically. You can also switch to manual syncing. It only takes a click to sync the latest changes. Why is an app like this useful for me? I mostly write copy on a desktop machine, but you never know when inspiration will hit. This is especially helpful for writing blog postings. Being able to write down my initial thoughts or an entire article, no matter where I am, with a simple text editor is very useful. I’m sure I will like it even more with a Bluetooth keyboard. I wrote this using the on-screen keyboard. It was actually a pleasant and productive experience. Nebulous Notes by Nuclear Elements, Inc.
via 18 Firms Sued Over App Privacy, Including Apple, Twitter, Facebook | News & Opinion | PCMag.com. Whether or not you follow the Getting Things Done approach to task management, Toodledo can help you keep track of all your tasks, both business and personal. Contexts (ie: Personal, Work) and Categories help organize your tasks into the right buckets. While Toodledo’s mobile apps are not free, I think they are definitely worth the asking price. The iOS version is a Universal app so you only have to buy it once for your iPhone and iPad. All versions, web and app, do a great job of filtering your tasks by almost any criteria, including starred tasks, category, context, recently completed, due date, etc. and all your tasks are kept in sync with the cloud. I’ve been using digital task managers going back to the Palm III, so I’m very choosy, and to me this is the best one yet. Lately I’ve found success reaching goals by using the Jerry Seinfeld Productivity Method, where you take a calendar and mark off a red X for every day that you work on your goal. You keep the chain of X marks going as long as you can and whatever you do, “Don’t break the chain.” Streaks has a great implementation of this in app format, and I’ve been able to achieve multiple goals, from learning and working on Customer Development to practicing guitar every day. My streak for playing guitar, a true stress reducer, is officially 365 days and counting without interruption as of last week, so I really think this app is a winner. Having a Traveler Guitar (which I also can’t live without) definitely helped. What goal do you want to work at daily? With this app you just might do it every day for the foreseeable future and reap untold benefits, or just have fun and relax. I broke out the credit card and upgraded to Evernote Premium today. I find it indispensable the more I use it. The note history, offline access and PDF search features are too good to pass up and $45 a year is very reasonable. I also should mention that I already have a Pro subscription to Toodledo. Here’s a link to a great article on Evernote from Inc.com. Looks like I’m not alone in singing their praises. Look past the hype. The cloud can be your competitive advantage. Cloud computing is an obviously overused term and many small businesses are skeptical, as I can attest to from some recent conversations with local entrepreneurs. I’m not surprised as this term has been stamped on so many products to the point where it loses its meaning, but if we ignore cloud technologies we pass up on several advantages for our business. The cloud can host your applications and data. Here the potential savings in cost, time and resources can be substantial. You don’t need to manage your own email, collaboration or CRM server: you have multiple service providers to choose from. Even documents and spreadsheets can be created and stored online with Google Docs. This results in reduced IT staffing costs and savings on licensing and infrastructure for your business. You can’t beat the economies of scale of a SaaS vendor. When the need arises for temporary computing power, cloud infrastructure solutions such as Amazon Web Services can fill the gap, a better alternative to having hardware sit idle and underutilized. You as an entrepreneur can stop being a part-time IT resource and focus more on your business. Once you start using multiple devices (i.e. smartphone and tablet), the need for the cloud becomes even more obvious. When you are out in the field you want to access and update your information, but once you are back in the office you may be more productive using your desktop. This requires desktop and mobile applications that can sync their data. Without the cloud, keeping data consistent among multiple devices is much more difficult, even more so if you want to collaborate with your team. More and more mobile apps with corresponding web/desktop versions are coming to market with the ability to sync with the cloud. The team that can communicate and collaborate more efficiently wins here, and the cloud can help streamline all this. Smaller organizations have the advantage in adopting new cloud and mobile technologies which are becoming available at an increasingly faster pace. In most cases a small business can adopt innovations at the pace they choose. Large companies must go through a long vetting and purchase process, creating a significant lag in realizing productivity gains. If you find a mobile cloud enabled database app that you know will make life easier, you could start using it today. App stores with customer reviews and vendor web sites with adequate product information, demos and testimonials should help you to find the tools that fit your needs without being on the bleeding edge. This knowledge and experience could also be valuable information that you can pass on to your own customers. It is natural to be skeptical of the cloud, but don’t miss the chance to gain an edge. Look at the tools available and understand what real problems you can solve. Become more agile and responsive than your competition by having the right tools and information at the right time. Klisto™ is a personal and team database app for your iPhone® and iPad™ devices that syncs with the cloud and makes sharing and collaboration easy. By leveraging mobile technologies, small businesses can be more agile in responding to opportunities, providing a competitive advantage that can lead to increased profitability. The goal of this blog is to help you make the most of today's mobile world.